I started posting art on my Instagram only three years ago, and it was out of a place of desperation. Not desperation for likes or a following, or anything that you may be thinking. I posted to Instagram because I needed a way to pull myself up out of darkness. Art was that thing, and Instagram was the vehicle for accountability to myself. As a young mother fresh into a second round of postpartum depression, I had committed myself to making something for at least 2-5 minutes a day for the rest of the year. Because I had a history of struggling with long commitments, I knew I needed an external way to keep myself going and making. So I decided to post to Instagram. Not for anyone else but me, and as a way to visually congratulate myself that I had made something new that day. I had no idea how much it would end up growing, or that I would be able to start selling my work professionally (later on) as a direct result of showing up on Instagram. I posted my first picture on March 17, 2017 - the start of something new. 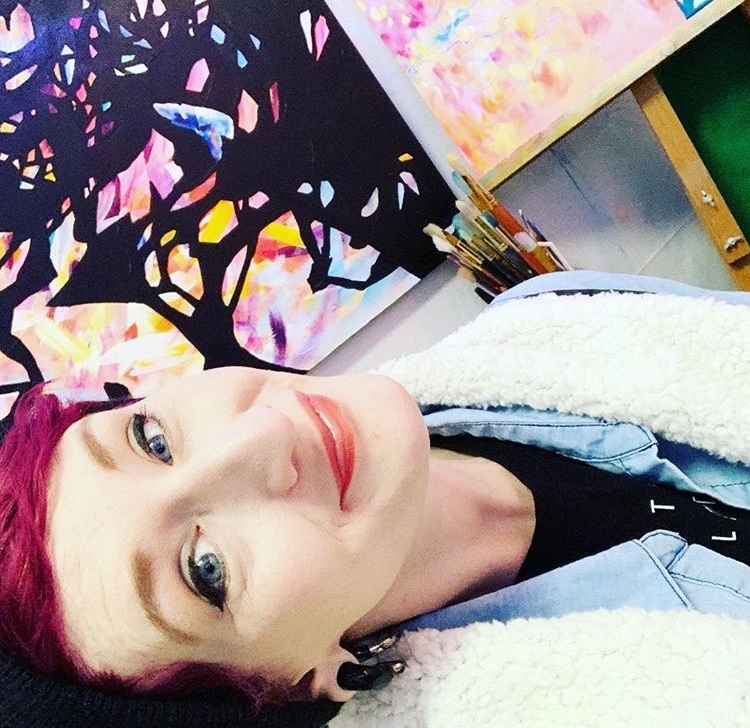 From that point on, I have grown immensely as an artist and a person, and made the most amazing connections all over the world through this platform. It wasn’t just because of my work, it was because I started showing up and sharing my story. I’ve learned a ton along the way, so today I just want to give you three reasons why I love this tool so much as an artist, and how it can serve you too. 2. Social media is an opportunity to have a digital portfolio - Think about what artists had to do to get their work out there in the past. Not that long ago, if you were an artist and you wanted gallerists and other people to see your work, you would have to physically bring it to them. As in, carry your pieces, or photos of your pieces, to those people. You’d have to reach out and it took a lot more steps than it does now, thanks to social media. Now, all you have to do is start putting yourself out there digitally. You can post a picture of a painting you’ve just finished, or better yet, of you’re creative process… and immediately you’re able to invite people from all over the world into your studio for a first hand look at what you have to offer. Brands and galleries are all on social media too, and Instagram is the perfect opportunity to show off your work without ever leaving the couch. In fact, I had a gallery in North Carolina reach out to me several years ago when I was still pretty new to all this because he liked what he saw and wanted to include me in a group show - which he did. Pretty rad, right? 3. You can find your people - Instagram presents a very real opportunity for your to connect with real humans from all over the world. People that you would never have access to otherwise. Almost everyone is connected by the internet now, which means that it doesn’t matter how weird you are (the weirder the better, actually!) you can find people who resonate with you and your work. Is it as easy as just posting something and expecting them to come to you? No. Instagram like everything else has a learning curve and requires intentionality and strategy. The good news is, you’re not alone in this journey. I love Instagram. It has been a tool to connect me to so many amazing humans and opportunities, and I’m so excited to show you more about it. Grab your ticket and join us! And reach out to me on social media - I’d love to chat! This past month at the Yards was so fruitful! Quite literally the first week was spent stretching my hibernated watercolor muscles by painting tangerines. The fruits were just stepping stones into a grove of forgotten ideas. As I stretched my arms, I had to stretch my mind. For multiple years I had focused narrowly on a specific group of work and my mind was uneasy and unprepared for something new. Where were my ideas!? To tell you the truth, they usually sit and live either on small scraps of paper in various folders, or somehow they float about in my mind, usually held down by a single string. If I do not jot them down within the minute they have more than likely floated away. So I quickly turned to those ideas I had recorded. Within a plastic folder I found a collection of journals from 2015. They aren't exactly your typical school grade journal, but rather a collection of various illustrations. For the past three years I have been 'journaling', but in a more abstract manner. I have been jotting down succinct words or phrases that describe a day, an experience, or an idea that I wish to remember. From there I created maps, or small illustrations reflecting those notes. They have become what I call now, "Mind Mappings". They are small glimpses into cherished moments, salty memories, or merely nostalgic thoughts that bring a smile to my face. These journals give me time to reflect and dissect events. They help me understand how I've grown and changed from those experiences. They are mind maps full of abstracted memories and feelings. During this past month of reflection I completed many of these Mind Mappings that had not yet been completed since I jotted down my thoughts. Refreshed by this breeze of nostalgia I began to consider less about the past, but more of the present. Where I was, right then and there! As January had become a month of reflection I decided to create a series of six drawings based on this month. Each focuses on a specific part of this past month and its importance to me. By considering my many actions, ideas, and choices I reflect how they shape the course of my life. I asked myself many questions: How can minute details can shape you? What about your 'routine' can influence your outlook in life? Do you enjoy the small pleasures in life? What are they? "Write them down, Victoria!" my brain shouted! Thus I created a lively abstracted collection of January. I have continued reflecting into the month of February and have been planning on reflect much more as this year progresses. I am so grateful to having the opportunity of being part of the Yards Residency program. The A-I-R has given me time to reset my brain in order to pursue a new group of work. Being part of the Yards has provided me space, time, and a community that helped me to brainstorm and bounce my ideas. Leading up to my first artist residency I had a million and one things I wanted to create. I was reading blog posts about how to execute them well. It was clear to me that I was going to make my presence known with precise execution. But, life said differently. For those who are unaware. An artist residency is a time where a creative can focus on their craft. Residencies can be a month to a year; maybe even longer. Most residencies give one to opportunity to have access to studios and supplies. While others may provide housing to the artist while they create. This description is just the tip of the iceberg because they truly can be artistically extravagant. On January 2, 2019 I returned to the gallery I was interning at . For the prior month I was warmly welcomed into this collaborative artist studio space called The Yards. Never have I been in a space where the egos were dropped and their hearts were wide open with art on their mind. This was everything I hoped for in a community. Welcome to The Yards Collective Blog!